The mercury is rising. The sky is blue. Summer is nigh. 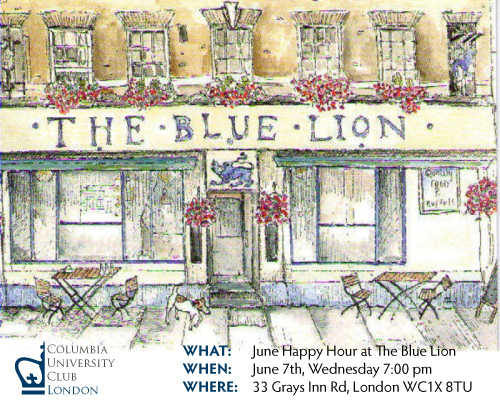 Start it off in proper fashion by joining us on June 7th for our happy hour at The Blue Lion on Gray's Inn Road. We'll be welcoming current Columbians who are in London for the summer, interning via the CEO (Columbia Experience Overseas) program and the newly minted CU There! 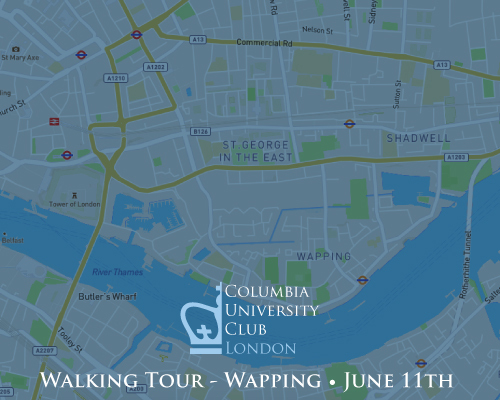 Later that week, on June 11th, we have our second walking tour. The afternoon will be spent exploring the historic district of Wapping in East London. It's fun, and it's free! 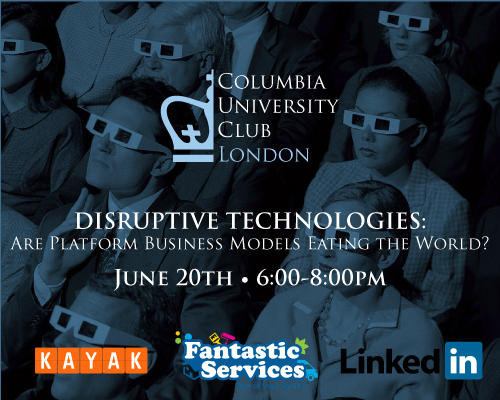 Lastly, be sure to register for our new Disruptive Technologies series taking place on June 20th. Our first topic: Are Platform Business Models Eating the World? with a stellar panel moderated by Benoit Reiller (BUS '04), co-author of "Platform Strategy". Don't forget to save the date to celebrate America's Independence from Britain (luckily they’re now besties) on the 4th of July. Details to follow. We've had a busy few months and we're not slowing down. We look forward to seeing you at our next event. Leila Bassi holds a BA with a major in Political Science from Barnard College (1994) as well as an MBA from Columbia Business School (2000). She started her career in the music industry, working for a major record company and an online music startup. After business school, she held various positions within the financial services both in equity research and asset management. She currently lives in London with her husband and two children. Leila is an Alumnae Trustee at Barnard College and has served as the President of the Barnard Club of London for over five years. Fintech II: Institutional Re-invention: Can old dogs learn new tricks? "Can Old Dogs Learn New Tricks?" The second event in the Fintech Series reversed the focus of the March launch event, which explored how plucky upstarts were disrupting existing packages of banking services and inventing new ones ("Smart Banks for the Smartphone Era"). Mark Gray from the British Business Bank highlighted the role of the state in fostering innovation by funding intermediaries who then back winners. Elly Hardwick, who runs Innovation Labs within Deutsche Bank, laid out what was a ‘two-way street’ of communication and forward planning for effective collaborations between giants and start-ups. Ella Rabener of Scalable Capital clarified misunderstandings about ‘robo-trading’ and its benefits for small investors. Finally, Tim Hanford, Managing Director for Europe at JC Flowers & Co, emphasised how much proprietary research and risk management information is still offline or time-intensive to get, in order to do the best for clients. The moderator for the event, Hayley Ard (Oxford University) is finalising the steering group for intellectual ownership of the joint Fintech Series going forward, so get in touch to get involved. Columbia Experience Overseas (CEO) is an internship program organized by Columbia University to give Columbia undergrads an overseas experience. London has ten interns coming over in June. We wish them well and hope to see them at many of our events. Join us for happy hour at the The Blue Lion. Open to everyone in the Columbia community so please join us for a pint. A change of plan for this interesting event! Still in the East of London but now we are going to explore Wapping. Wapping is famous for its riverside pubs, in the heart of the old London docks. The docks were the hub of the nineteenth century British Colony trade in commodities. Stay tuned for details regarding our July 4th happy hour. Join CUCL with support of the Columbia Alumni Association (CAA) for this year's Columbia Connects—bringing alumni together to share our shared Columbia experience, welcome new graduates to our Columbia communities, and build a stronger network of Columbians across the globe. It will be scheduled in the last week of September so please look for more details.